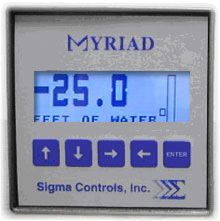 The Sigma Myriad ‘ROS’ (Remote Operator Station) is a microcontroller based, state of the art, Remote Operator Station for remote monitoring of variable speed drives, control valves or similar control devices. The ROS is used with a primary measuring device whose output signal is compatible with common analog outputs 4/20MA, 0-5VDC, 1-5VDC, and 0-10VDC. Speed or process information is displayed in numeric format on the ROS’s graphic LCD display along with the current value of the analog output. All aspects of the unit are user configurable through the ‘plain English’ menus and combinations of the 5 user data key push buttons. Available in 2 styles of mounting, 1/4 DIN (4” x 4” nominal) and wall mounted Nema 4X enclosures, the Myriad ROS is suitable for installation in all industrial environments. Several optional add-on boards are available to increase input/output capacity and processor capability of the base unit. Dual RS485 ports are standard and may be used for remote communication/control using Sigma Myriad MVNET or with the optional protocol converter MODBUS® RTU protocol.